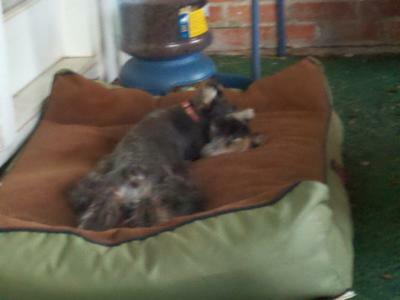 I have two female Miniature Schnauzer's from the same litter. Most of my friends and family cannot tell them apart. They are Black and Silver and very sweet lovable girls. Daisy is 15 lbs and Nikka is 11.5 lbs so I don't think it is hard to tell them apart. Mostly it's their demeanor. They both love going after any birds or squirrels in the backyard. They both love to play with each other and with our new addition of a 4 month old female boxer, Judo. Judo is already towering over Daisy and Nikka but loves to play as much as they do. Daisy loves going in the car and standing in my lap while I drive so she can rest her head on my left arm looking out the window. Nikka is the fearless protector of the home. She lets me know when someone is at the door or in our driveway anytime. It's like having a doorbell for the driveway. These two girls are inseparable. They sleep in the same bed all curled up together. Daisy takes care of Nikka and cleans her alot. They both sleep in the bed with me all curled up beside me and each other. They sound wonderful! You are brave bringing in another lovable pet boxer ~ Judo. They'll have a ball growing up together, that's for sure! 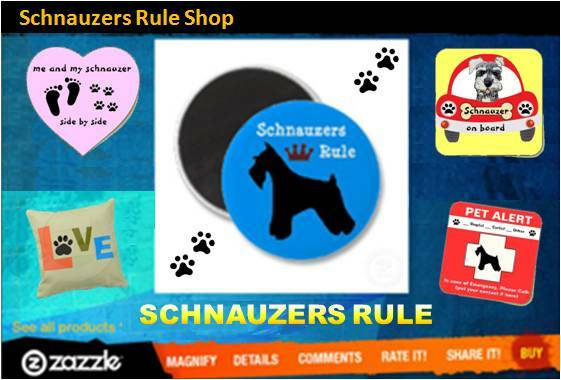 Gotta love those Schnauzers!